The IT sector is continually evolving, creating challenges for businesses in finding skilled talent, staying at the leading edge of technology innovations, and many other topics. 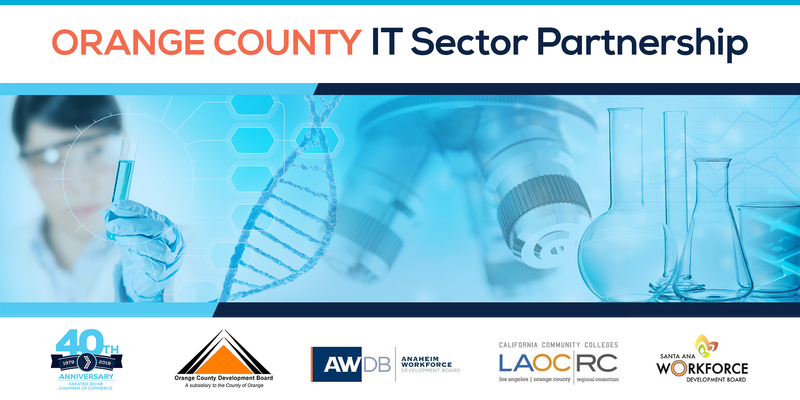 IT professionals are invited to participate in the launch of the Orange County IT Sector Partnership to collaborate with IT and community organizations and partner companies to navigate these demands. Through collaboration, a clear set of priorities and an effective course of action can be established. Understanding the value of like-minded business leaders, we invite you to participate in the launch of the Orange County IT Sector Partnership. Together, we can work on these important issues. If we are to continue to thrive and provide opportunities to our community and rising youth, it requires your care and involvement in the partnership. This network will provide an arena where we can set priorities and take direct action, rather than rely on the public sector or worse, approach it alone. The intention of this launch is to emerge from this meeting with a clear set of priorities and a course of action. Partners in the community such as workforce and economic development, education, chambers of commerce, and others will be in attendance to better understand how they can collaboratively and strategically meet your business' needs.